Facts & Trends recently spoke with Randy Alcorn, author of an important new book titled Happiness. Alcorn’s latest book has been gathering acclaim. Popular bloggers Tony Reinke and David Murray have declared it their 2015 book of the year. And for good reason. Alcorn makes a strong biblical case for the rightness and goodness of happiness for all God’s people. Facts & Trends: Why did you write a book on happiness? And how do you define happiness? Randy Alcorn: Among Christ-followers, there’s a tendency to minimize happiness and make it sound unspiritual because people in the world are trying to find happiness in sin. I argue in the book the problem isn’t they’re trying to be happy. Rather, God wired us to seek happiness. The problem is we seek happiness in the wrong places, rather than in the right place—in Christ. The Bible tells us explicitly the gospel is very much about happiness. Consider Isaiah 52:7, which says, “How beautiful upon the mountains are the feet of him who brings good news, who publishes peace, who brings good news of happiness.” Paul clearly refers to Isaiah 52:7 in Romans 10:15 as he references the gospel, demonstrating this “good news of happiness” is in fact nothing else but the gospel of salvation in Jesus Christ. The gospel is about bringing a deliverance from sin, of course. But the result is to be not only our holiness but also our personal happiness. True holiness (not the false, Pharisaical, self-exalting kind) and true happiness (not the false, superficial, sin-seeking kind) are two sides of the same coin. Happy holiness is God’s ideal for us. F&T: So, would you say the Bible teaches that God is happy? “In your presence there is fullness of joy; at your right hand are pleasures forevermore.” (Psalm 16:11) As love and holiness are found in God’s presence because God is loving and holy, so joy and happiness are found in God’s presence because God is joyful and happy. How could it be otherwise? F&T: Does God want us to be happy? Alcorn: Yes, I believe God desires us to seek and find our happiness in Him, the Source of all joy. Contemplate these words: “The Lord make his face to shine upon you and be gracious to you; the Lord lift up his countenance upon you and give you peace.” (Numbers 6:25-26) Isn’t this a call for God to endow His people with happiness? If we grasp just how happiness-saturated Scripture is, it will radically affect our perspective as God’s children and greatly expand our outreach to the world. Whatever else the plan of God and the gospel of Jesus encompasses, without question it includes our happiness. Of course, if we compare the value of our happiness to the value of God and His glory, our happiness is infinitely outweighed. But the same is true of everything else. Just because God and His glory are infinitely more important than our families, friendships, churches, and jobs, that doesn’t mean any of those are unimportant. Indeed, God Himself tells us they are important. F&T: Is it selfish to pursue happiness? Alcorn: This distorted notion that wanting to be happy is inherently selfish, and therefore immoral, is believed by many Christians. It’s true that Scripture warns of a self-love that is obviously wrong. (2 Timothy 3:2) But when Jesus tells us to love our neighbors as ourselves (see Matthew 22:39), He isn’t arguing that we shouldn’t love ourselves, only that we should extend our instincts for self-care to caring for others. Some parents believe looking after their children’s happiness means constantly saying no to their own. But if they don’t take care of themselves, failing to cultivate and model happiness in God, they’ll deprive their children of happiness, too. Flight crews routinely announce, “If you’re traveling with a child or someone who requires assistance, in the case of an emergency, secure your own oxygen mask first before helping the other person.” Those instructions may sound selfish, just as it sounds selfish to say that one of our main duties in life is to find happiness in God. But only when we’re delighting in our Lord do we have far more to offer everyone else. F&T: Does a person’s happiness depend on their circumstances? Alcorn: Yes and no. In our fallen world, troubles and challenges are constants. Happy people look beyond their circumstances to someone so big that by His grace, even great difficulties become manageable—and provide opportunities for a deeper kind of happiness. Part of being a Christian is experiencing the underlying and overarching happiness in Christ that goes beyond circumstances. Our happiness is dependent not on temporary circumstances but on our eternal perspective. Still, it’s fair to recognize positive life circumstances can prompt real and emotional joy and happiness. This is an important correction to the modern sentiment that being happy due to positive circumstances, including the welfare of loved ones, is somehow unspiritual. True, circumstances change and our happiness should be grounded on Christ, who doesn’t change, but that doesn’t make it inappropriate to rejoice in favorable circumstances. F&T: How can we be happy when there’s so much evil and suffering in the world? Alcorn: Romans 8:28 says, “We know that for those who love God all things work together for good, for those who are called according to his purpose.” By recognizing and believing in God’s sovereignty, even over Satan’s work, our perspective is transformed. The gospel’s good news is because of Christ’s death and resurrection, happiness, not sorrow, has the last word—and it will have the last word forever. This secure future invades our present, so that even while death and sorrow remain, the new normal in Christ isn’t sorrow but happiness. We certainly live in a world filled with suffering and death. But as believers, we understand God is with us and won’t forsake us, and one day we’ll live on a redeemed Earth, a place full of joy and delight. Yes, the day hasn’t yet come when God will “wipe away every tear from [His children’s] eyes.” (Revelation 21:4) But it will come. Anticipating this reality has breathtaking implications for our present happiness. F&T: Should we only find happiness in God? Or is it OK to be happy with our family, friends, work, pets, flowers, and forests? Alcorn: God is primary; all other forms of happiness—relationships, created things, and material pleasures—are secondary. If we don’t consciously see God as their source, these secondary things intended for enjoyment can master us. But by recognizing God as primary, we maximize our enjoyment of the secondary with no danger of idolizing it. The better I know Jesus, the more I see Him all around me—in people, animals, places, and objects. When I find happiness in playing with and hugging our golden retriever Maggie, I am finding happiness in God, who I recognize as her Maker and the gracious Father who entrusted her to our care. I’m in no danger of making Maggie an idol, a God-substitute, when I recognize and praise Him for her and thank Him for the joy He imparts to us through her. When we invite God into our happiness, we become aware of how He invites us into His. The happiest times of my life are when I’ve entered into the happiness of God—not only through Bible study, prayer, and church, but also when reading a good book, laughing with a friend, running, biking, and enjoying the wonders of creation. F&T: What can we say to people who seek happiness in sin instead of in Jesus? Alcorn: Scripture recognizes there are “fleeting pleasures of sin” (Hebrews 11:25). An injection of heroin or an immoral act can bring moments of pleasure—but not deep and lasting happiness. Sin can for the short term make us happy, but it won’t leave us happy. In fact, it’s the biggest enemy of happiness because it results in a broken relationship with God. But instead of backing away from happiness or trying to correct those who love the word happiness (which almost everyone does, except some inside the church), we should embrace it, realizing that Jesus is inseparable from happiness. If someone declares a desire to be happy, we should never say, “You just need to obey God and forget about being happy.” Rather, we should say, “God wired you that way.” Then we can ask, “Have the things you’ve thought would make you happy always worked out for you?” The answer is probably no. That’s the time to suggest, “Maybe you haven’t looked in the right place.” We can then present the Bible’s bad news, which explains the sin problem that makes them unhappy. Then we can share the good news of the gift of God that can reconcile them to their holy Creator and thereby make them eternally happy. Randy Alcorn is the founder and director of Eternal Perspective Ministries and a best-selling author of more than 40 books including Heaven, If God is Good, The Treasure Principle, and Happiness. 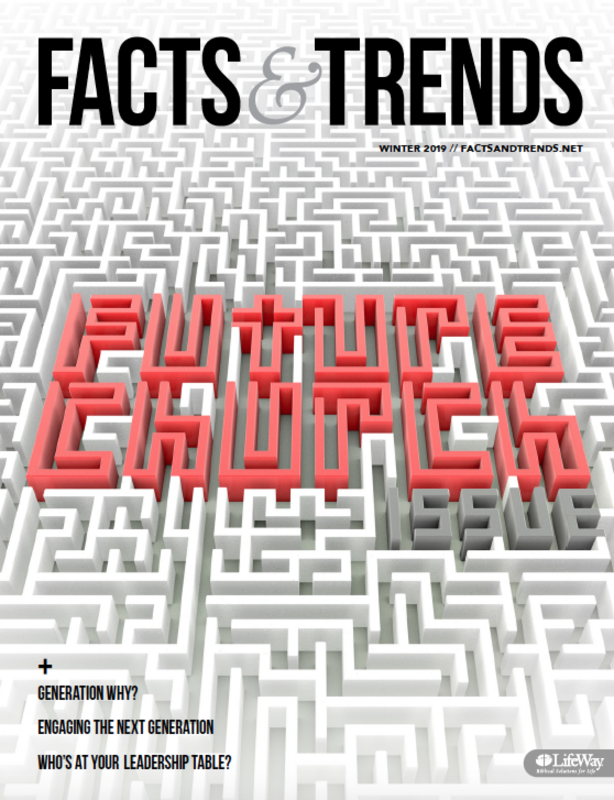 MATT ERICKSON (@_Matt_Erickson) is managing editor of Facts & Trends.